In large bowl, dissolve 1 1/2 tablespoons espresso in hot water. Beat in butter, shortening, 1 cup granulated sugar, the brown sugar and egg with electric mixer on medium speed until fluffy. Beat in flour, baking powder, 1 teaspoon espresso, the cinnamon and salt on low speed. Divide dough in half. Shape each half into 10-inch-long roll. Wrap each roll with plastic wrap; refrigerate 30 minutes. On large plate, mix coating ingredients. Roll each roll of dough in coating (reserve any remaining coating). Rewrap in plastic wrap; refrigerate 2 hours longer. Heat oven to 375°F. Cut each roll into 1/4-inch slices. On ungreased cookie sheet, place slices about 2 inches apart. Sprinkle with remaining coating. Bake 8 to 10 minutes or until edges are light brown. Cool slightly; remove from cookie sheet. Cool completely. 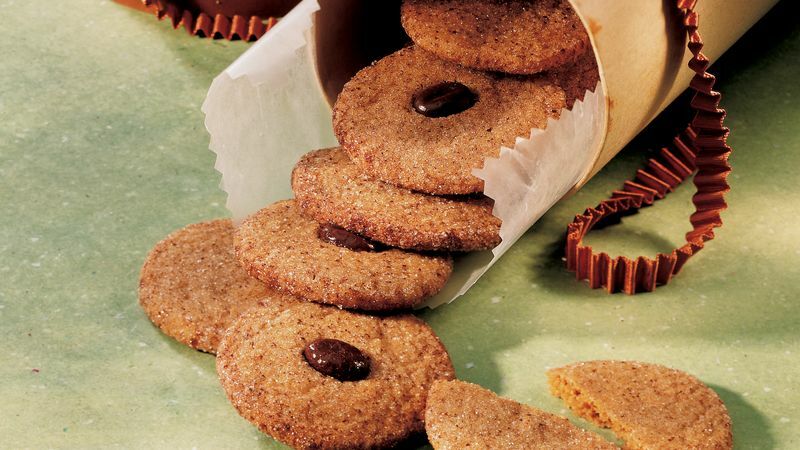 Serve these delicious morsels with vanilla or chocolate ice cream, or package them up with coffee mugs and freshly ground coffee for a gift that any coffee lover will enjoy. To keep your cookies nice and round, rotate the roll frequently while you're slicing. This will keep you from flattening one side.